A couple months ago I hear a great keynote on innovation and the endless possibilities it has with growing one’s business or area of expertise. At first I was completely overwhelmed with the idea of how I could integrate innovation and networking but I came to learn that there were numerous ways to blend them together. When you hear the word innovation, what comes to mind? Perhaps you think of Google, Facebook, AI, NASA’s Space Program or creative geniuses such as Picasso or Frida Kahlo. For me I used to think that innovation had to be something super unique, a concept, idea or item that would essentially blow your mind and transform cultures and communities. Luckily, I was wrong. Innovation is actually accessible to each and every one of us regardless of our artistic, creative, or technological levels of expertise. According to Merriam-WebsterInnovation, for its part, can refer to something new or to a change made to an existing product, idea, or field. One might say that the first telephone was an invention, the first cellular telephone either an invention or an innovation, and the first smartphone an innovation. I love this definition because it makes the notion of innovation available to everyone. You don’t have to be the world’s smartest person to be considered innovative. In fact, all you have to do is be open to changing, shifting or pivoting something you already do or have done and be open to new results. When we think about connecting innovation to networking the possibilities to change how we network and see results are endless. Here are two ways that anyone can incorporate innovation the next time they network. 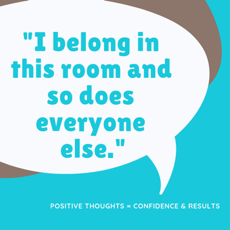 Can you honestly tell me that the last time you went to a networking meeting or event you were really psyched and were telling yourself positive things in your head? My guess is probably not. Don’t worry you’re not alone. Most people struggle when it comes to networking and it all starts with our thoughts. We can be innovative while networking if we take a few moments to be intentionally positive about what we’re thinking before, during and after we network. Instead of hearing yourself say things like, “Ugh, why am I even going to this event?” or “Do I even have anything worthy to offer or share when I meet new people?” why not try something more uplifting that will raise your confidence AND help you appear more approachable to others. Here are a few ideas that help me when I’m feeling a little nervous before a networking happy hour, conference or meeting. - I belong in this room and so does everyone else. - I am smart and I have worthy thoughts to share with others. - I don’t have to be perfect, all I can do is try my best. - Regardless of what others say I am in control of how I feel. - Once I’ve met 3 new people I can give myself permission to leave and feel good about what I did today. Using our breath as a way to calm our nerves before and during networking is another way to incorporate innovation. Remember, being innovative is making small changes to something you already do and what better thing to upgrade than the infinite power of breathing. There are countless articles and studies that highlight the innumerable benefits breathing has for our whole bodies. According to this article, The Health Benefits of Deep Breathing: 9 Ways it Supercharges Your Body and Mind here are the top 3 ways using our breath properly help us. Oxygen is the most essential natural resource required by our cells. We can go without food for up to 40 days and without water for 3 days, yet we can die after just a few minutes of not breathing. From a purely physical point of view, breath equals life. One of the benefits of breathing deeply is that it helps to release tension in the diaphragm and primary breathing muscles, relieving many long-term respiratory issues such as asthma and breathlessness. It opens up the chest, releasing tension from the intercostal muscles and around the scapula, erector spinae and trapezius muscles, allowing for a more relaxed posture. Deep breathing activates the parasympathetic nervous system, bringing us into a relaxed state. It functions in the opposite way to the sympathetic nervous system, which stimulates activities associated with the fight-or-flight response. I like to use the 3,4,6 breathing counting method (see picture below) as a way to innovatively network. Since you’re already breathing all you have to do is slow down and be intentional about your inhales, and exhales. Essentially all you have to do to is inhale for 3 counts, hold your breath for 4 counts and then exhale as slow as you can trying to reach a count of 6 exhales. Now, if you can’t hit those numbers (exhaling for 6 counts is hard!) no worries! Do your best and keep practicing. The more you practice the easier it will become and the better you’ll feel. So remember, before you walk into a networking situation and your nerves are going crazy, simply change your mindset and take a few deep breaths. If you’re ready for more try the 3,4,6 breathing method and enjoy! If you’re looking for even more ways to define innovation check out this article, What is Innovation? 15 experts share their innovation definition. I’d love to hear from you. How can you be innovative with your networking thoughts so that you take something you’ve already thought about yourself or your work and shift or pivot it so that it enables you to be a stronger connector? If you have any lines that you’re willing to share feel free to share them with me via email at alyceblumcoaching@gmail.com or on my facebook page by clicking here!